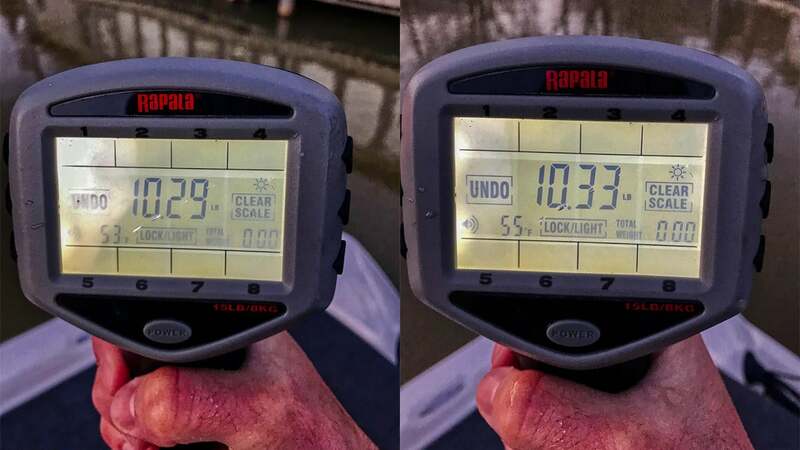 Chase Hunnell and Tyler Patterson had the fishing trip of a lifetime on Kentucky Lake on Saturday March 16, 2019. 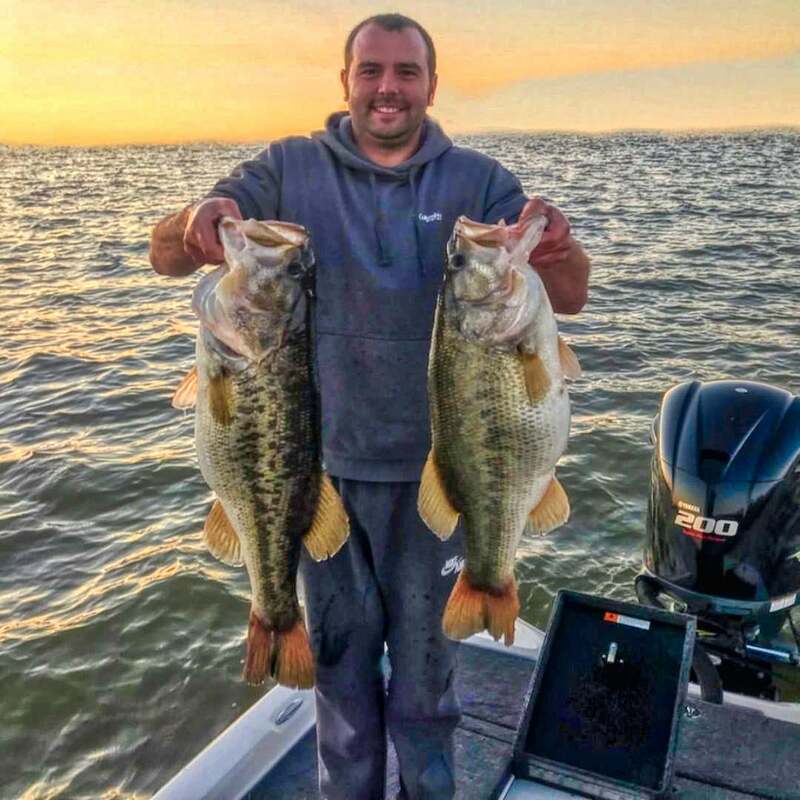 Hunnell managed to catch not one but two fish weighing more than 10 pounds and the duo was able to land a limit roughly between 39 and 40 pounds. Here is the full story on their day in Chase Hunnell’s own words. Be sure to read the story and check out all the pictures at the end. Just an amazing catch on a fishery that is cycling back up after a rough down cycle in 2018. "I had some things to get done for my new business, so I couldn't get to the lake early that morning," Hunnell said. "When I got finished, I decided it would be a great day to go fishing. The Cumberland River at home here in Ashland City has been a mess from the recent floods, and I didn't want to go there. I figured with the water dropping at Kentucky Lake it would be a great time to get out there. "I got on the road at 1:30 PM, met my cousin Tyler Patterson on the way to the lake, stopped for fuel and snacks and pulled up at the ramp at 3:30 PM. We put the Stratos in the water on the south end of the lake, fired up the Yamaha SHO and headed to our first stop. "It didn't take long to figure out what the fish were doing, as we caught the first fish about 15 minutes into our trip. It was the smallest fish of the day at around 3 pounds. That bite keyed us in on what to do and another 3 pound fish came in the boat a few minutes later. The third and fourth fish came soon after. It was actually a double with Tyler pulling in a 5 1/2-pounder (second fish from right end in the group picture) and having to net it himself because I hooked one that was bigger. "He got his in the net and mine was right behind it, so he scooped it in with his. Mine hit the scales at 6.94 pounds (middle fish in pic). "With as little time as we had for the evening, that made the day worth it. We had no clue what would happen over the next couple of hours. When we got those two in the boat, we weren't sure what was about to happen, so we decided to put them in the livewell to see what kind of limit we could put together. "We ran to a new spot shortly after that. It was the same setup as the first. We made our way down the stretch, and it wasn't long before I hooked into something big. It was just pulling with solid weight. No head shake, just moving. It eventually made its way under the boat and actually headed out the other side. I then felt the line lifting, and I told Tyler she was about to jump behind the boat. That's when we knew it was a giant bass. What seemed like a few minutes later, Tyler netted the big bass as the hook came out of the fish's mouth. "I saw the fish laying there, and I immediately hoped it would make 10 pounds. 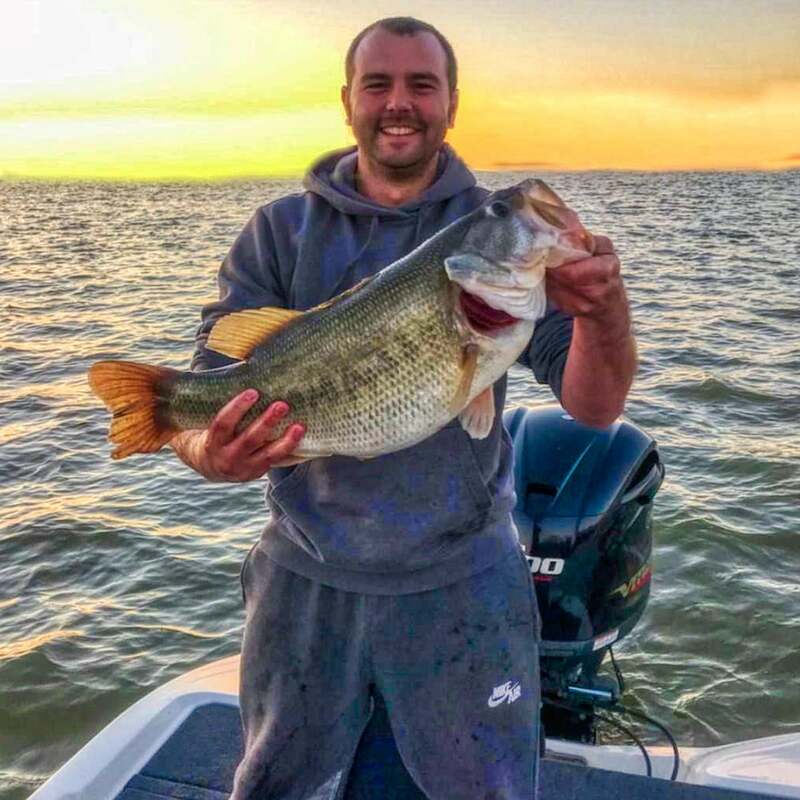 I have been after a 10-pounder on Kentucky lake for the past few years, and I knew I was close after my fishing partner Mason Nicholson and I have had 3 over 9 1/2 pounds in the last 2 years. Two of those in tournaments. I weighed the fish and was ecstatic to see that it came in at 10.29 pounds. That is the fish on the far left end of the group picture. "I was pretty tore up catching the fish. I believe it had my blood pressure up because I felt a headache coming on. I calmed down, got recollected and went back to fishing. A few minutes later I caught another fish around 4 pounds. The bites stopped on that spot, so we decided to make another move with the day coming closer to the end. "We pulled in on our last spot of the day feeling pretty confident the fish would be around there as well. It didn't take long for us to find out we were right. I hooked into a fish quickly. It was definitely another big one, but it came unhooked. I continued to work the cast after the fish came off and I hooked another one a few seconds later. I got that fish in the boat which came in at 6 1/2 pounds (far right fish in the group pic). 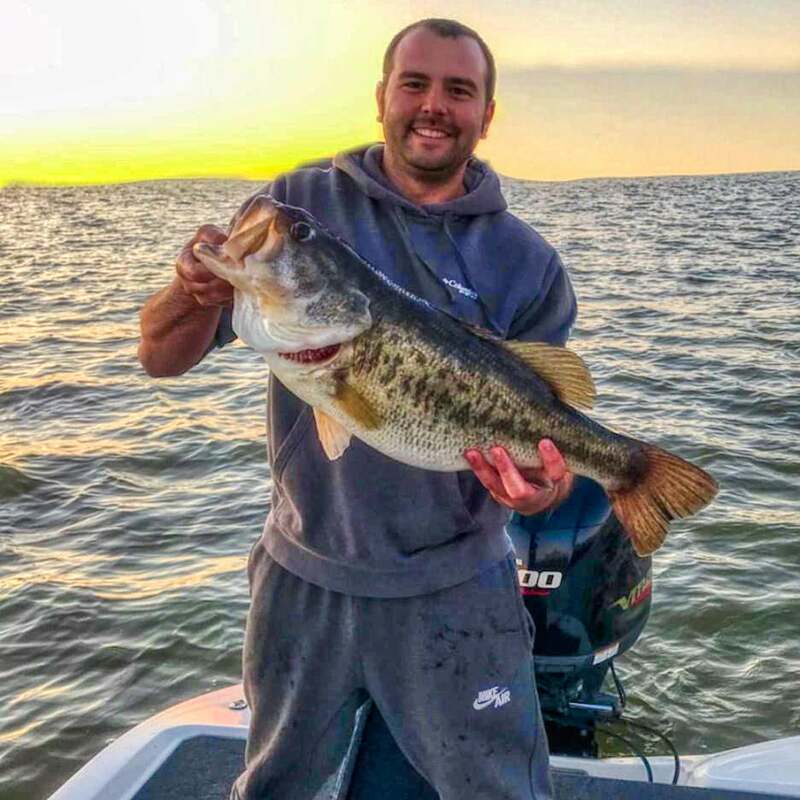 "The next cast produced another big bite. It pulled really hard. Drag was coming out, which was set pretty dang tight, so I knew it was another 10, maybe even bigger than the last. The fish jumped about halfway to the boat, and it was so big around, I couldn't believe what I saw. At that point I knew this would be one of the most special days I could ever have on the lake if I got that fish in. I played the fish slowly when it got close to the boat because I really did not want this to be just a story if she came off the hook. "I did not mention earlier, but I had already lost several big fish in the mix with the others that day. "Tyler eventually got the fish in the net and we both freaked out. I fell to my knees and sat down on the front deck of the boat at that point. Tyler was laid out in the bottom of the boat with the fish in the net below him. We were just in awe. That fish weighed in at 10.33 pounds on the Rapala scale (second fish from left in pic). 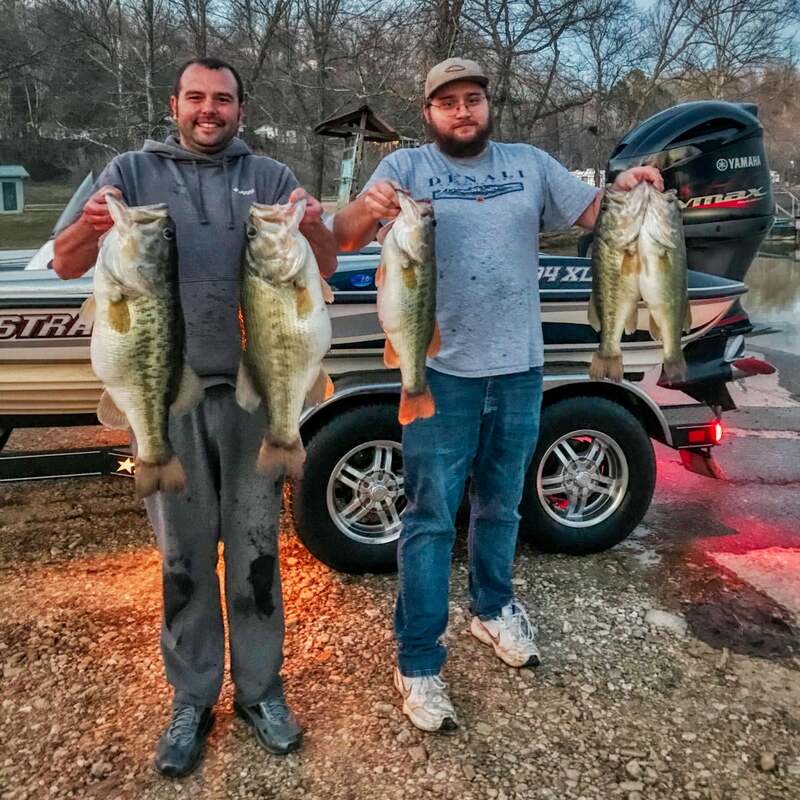 "We put the fish in the livewell and tried to fish a little longer, but we were both so emotional about what just happened, we decided we would be done at that point, about 7:00 PM. We took a couple quick pictures of the 2 big fish on the water and went back to the ramp. "We pulled the boat on the trailer and found someone to come take our picture. The fish were then released at the ramp. I will say that these 5 fish were not held out of the water for very long and they were only in the livewell for a few hours that afternoon. A couple were only in the livewell for about 30 minutes, since we caught them late. We boated 8 fish that evening and lost about that many more. All the fish were caught on Joe's Rods, Lew's baitcasting Reels, and Seaguar fluorocarbon line. "The lure will remain unnamed as I do not want to lie, but I also do not want to tell. That was it. That was the day." Congratulations to Chase Hunnell and Tyler Patterson on a fishing trip of a lifetime. Check out these other pictures from Hunnell of their day!